The championship game of NFL Europe, World Bowl XII, was played on June 12, 2004 and featured the defending-champion Frankfurt Galaxy against the Berlin Thunder, who finished with the best record. Berlin, under first-year Head Coach Rick Lantz, went 9-1 and was back in the World Bowl after the absence of a year, having won back-to-back titles in 2001 and ’02. The Thunder had the developmental league’s Offensive Player of the Year in QB Rohan Davey. RB Eric McCoo (pictured above) was NFL Europe’s leading rusher with 669 yards. Frankfurt finished second with a 7-3 record during the regular season, although two of the losses came in late-season contests against the Thunder. The Galaxy also had a first-year head coach in Mike Jones and had the rushing runner-up in RB Skip Hicks and the second-ranked passer in QB J.T. O’Sullivan. There were 35,413 fans in attendance at the Arena AufSchalke in Gelsenkirchen, Germany. The Galaxy had the game’s first possession, but four plays into the contest a J.T. O’Sullivan pass was intercepted by Berlin DT Montique Sharpe, who returned it 28 yards for a touchdown. Heinz Quast added the extra point. Frankfurt responded by driving 66 yards in 11 plays. O’Sullivan connected with WR Derrick Lewis three times and a 15-yard facemask penalty was tacked on to an eight-yard run by the quarterback. However, after getting a first down at the Berlin 11, the drive stalled and Ralf Kleinmann kicked a 28-yard field goal. A promising series by the Thunder ended with WR Chas Gessner being stripped of the ball while trying to gain additional yards after a catch and DB Chris Brown recovered for the Dragons. Following a Barcelona punt, a nine-yard run by Eric McCoo and two completions by Rohan Davey advanced Berlin to the Dragons’ 29, but McCoo fumbled the ball away. A mishandled snap gave the Thunder possession again at the Frankfurt 36 and Davey threw to TE Bryan Fletcher for 17 yards, but once again McCoo coughed up the ball to end the series. With two minutes remaining in the first half, and following yet another Berlin turnover, the Galaxy put together a five-play, 55-yard possession that culminated in O’Sullivan throwing to Lewis for an eight-yard TD. The drive was highlighted by an O’Sullivan carry of 17 yards that had a 15-yard personal foul penalty added on. Kleinmann successfully kicked the point after. There was still time remaining and, utilizing a hurry-up offense, the Thunder put together a 51-yard series in seven plays. Jonathan Ruffin kicked a 38-yard field goal and the halftime score was tied at 10-10. In the third quarter, an interception of a Davey pass by DB Lynaris Elpheage led to another scoring opportunity for Frankfurt, but a field goal attempt had to be aborted due to a bad snap and PK Kleinmann’s pass was picked off by LB Kevin DeRonde and returned 22 yards. On the next play, the Thunder utilized trickery as Davey handed off to WR Richard Alston on an apparent end-around, but he instead passed to a wide-open Chas Gessner for a 60-yard touchdown. Quast’s conversion put Berlin in front by seven points. The ensuing kickoff was returned 64 yards by WR Hugo Lira, but two sacks kept the Galaxy at bay. The Thunder were pinned back at their two after the punt, but runs by McCoo and catches on swing passes by FB Ed Stansbury moved the ball all the way to the Frankfurt 24. A pass into the end zone was incomplete and Ruffin kicked a 42-yard field goal to extend Berlin’s lead. The turnovers continued as the kickoff was fumbled by WR Jason Willis to give the Thunder possession at the Frankfurt 22, and while they couldn’t reach the end zone, Ruffin added another three points from 40 yards. Berlin took a 23-10 advantage into the final quarter. Both offenses bogged down until the Thunder scored once more on a 69-yard touchdown run by McCoo. Quast kicked the PAT. With Berlin up by a 30-10 score with six minutes to play, the game appeared to be a rout, but the Galaxy mounted a comeback. A 64-yard drive in five plays ended with O’Sullivan throwing to WR Drew Haddad for a 17-yard TD. Kleinmann again kicked the extra point. When the Galaxy got the ball back, they drove to another score. O’Sullivan this time connected with Lewis for a 19-yard touchdown. Kleinmann ‘s point after made it a six-point game, but that was the last gasp for the defending champs as time ran out on them and Berlin came away with a 30-24 win. The Thunder had the edge in total yards (451 to 255), first downs (22 to 20), and time of possession (32:39 to 27:21). However, in the sloppily-played contest, both teams turned the ball over five times apiece and Berlin committed a staggering 16 penalties, at a cost of 154 yards, while Frankfurt was flagged five times. Eric McCoo was the game’s MVP as he rushed for 167 yards on 28 carries that included the one long touchdown, making up for the two fumbles. Rohan Davey completed 19 of 29 passes for 212 yards with no TDs and one interception. Richard Alston and Ed Stansbury had five catches apiece, for 58 and 48 yards, respectively, and Chas Gessner led the Thunder with 80 yards on his two receptions. For the Dragons, J.T. O’Sullivan was successful on 19 of 33 throws for 210 yards and three TDs while giving up two interceptions and being sacked four times. He also led the team in rushing with 44 yards on seven attempts. Derrick Lewis caught 9 passes for 130 yards and two touchdowns. The win gave Berlin a third NFL Europe Championship, joining Frankfurt for the most in the developmental league’s history up to that point, although the Galaxy would win a fourth in 2006. 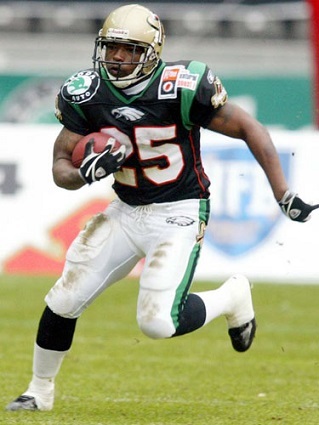 Rohan Davey and Eric McCoo became reserves with the teams that reached the Super Bowl following the 2004 NFL season, although neither appeared in that contest. Davey was a backup to New England QB Tom Brady, throwing a total of 10 passes over the course of the year, while McCoo was active for one game with the Philadelphia Eagles and rushed for 54 yards on nine carries.